The Commissioners are pictured with Debbie Mohler after approving a resolution for Sanctity of Life Day. Pictured from left are Mike Bartrum, Randy Smith, Mohler and Time Ihle. The Commissioners are pictured with Meigs High School Criminal Justice Instructor Mark Griffin after signing over a vehicle for use by the program. Pictured from left are Mike Bartrum, Randy Smith, Griffin and Time Ihle. 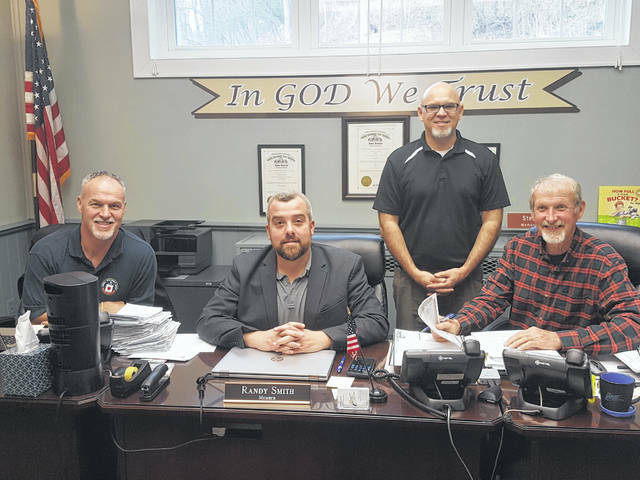 POMEROY — During Thursday’s regular meeting, the Meigs County Commissioners approved a resolution regarding Sanctity of Life Day, as well as the donation of a cruiser to the Meigs High School Criminal Justice Program. According to the resolution, in 1984 President Ronald Reagan issued the first proclamation designating Jan. 22, 1984, as the first National Sanctity of Human Life Day, and establishing it as the third Sunday in January. For 2019, Jan. 20 is designated as Sanctity of Life Day. 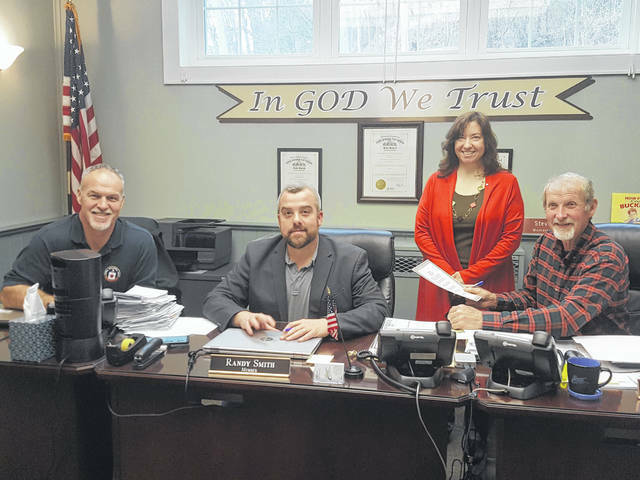 “We believe every life has purpose and we encourage the citizens of Meigs County not to take any life for granted,” read a portion of the resolution. Meigs High School Criminal Justice Instructor Mark Griffin was in attendance, receiving a donation of a 2011 For Crown Victoria cruiser from the sheriff’s office to be used for the program. This is the second time that the department has donated a cruiser for the program, with the first coming back in 2013. That vehicle has been used by the program up until now, but is nearing the end of its useful life. Griffin said it would be given to the auto tech program for use as they see fit. The cruiser will be used by the program to practice traffic stops and other skills. There are currently 25 students — 13 juniors and 12 seniors — enrolled in the program. In other business, the commissioners approved a contract for inmate housing with Monroe County. The first half appropriation for the Meigs County Historical Society was approved as requested in the amount of $8,500. Bills were approved for payment in the amount of $546,268.18, with $127,144.72 from the county general fund. Among the bills were several “Now and Then” bills which are bills exceeding the $5,000 threshold, and therefore require additional approval. Those bills included three for inmate housing the amounts of $5,915 to Monroe County, $10,075 to Washington County, and $35,640 to the Middleport Jail. The Meigs County Commissioners meet each Thursday at 11 a.m. in their office located on the third floor of the Meigs County Courthouse.